Pex Crimp Connection for hot & cold water pressure applications. Brass construction with drain for seasonal water supply. Can be used to control water pressure. 12" wall hydrant 1/2" pex with vacuum breaker is for use with pex tubing cold water pressure application. it should be installed at sufficient angle to drain properly when fastened to the wall. 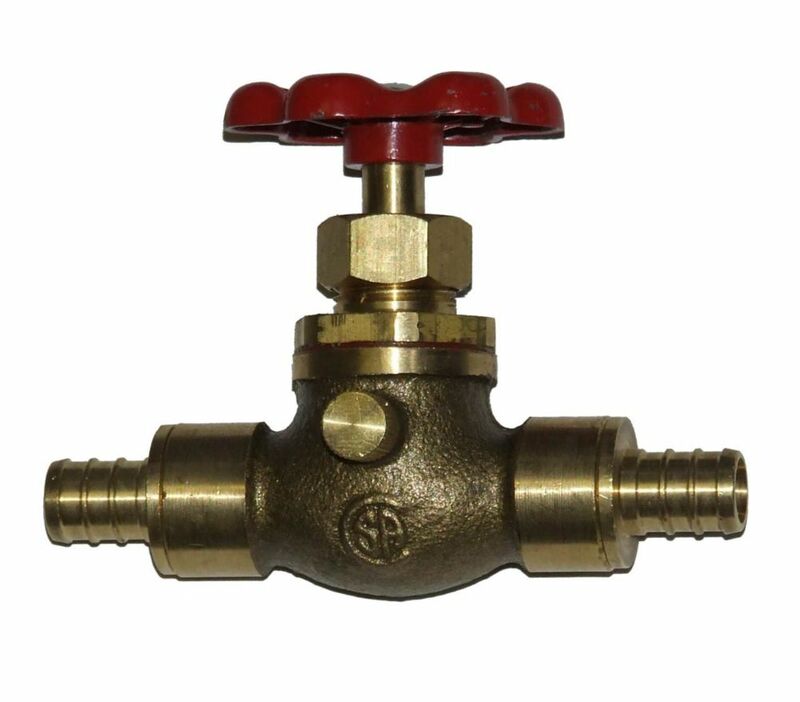 it is made of chrome plated brass and is non-freeze, meeting the Canadian standard for plumbing valves. The SharkBite 1/2 in. Barb x 3/4 in Machine Hose Thread Angle Multi-Turn Valve controls water flow to household plumbing fixtures. The Straight Stop Valve is used where the water pipe enters the room to allow for easy shut-off of water flow to the end fixture allowing for maintenance and repair without having to turn water off to the entire home. The SharkBite 1/2 in. Barb End can be connected to PEX Pipe using Copper Crimp Rings or Stainless Steel Clamps. The 3/4 in. Machine Hose Thread connection will work with Washing Machine Hoses. Pex Stop Valve with Waste - 1/2 Inch Pex Crimp Connection for hot & cold water pressure applications. Brass construction with drain for seasonal water supply. Can be used to control water pressure.